The Oracle Taleo Learn Learning Management System (LMS) has a long history with eSkillz. Originally the platform from Learn.com (acquired by Taleo, then acquired by Oracle) has been connected to eSkillz since 2007 when we began implementing and optimizing the LMS for our Learn clientele. As an Oracle Gold partner, eSkillz has been an integral partner for Oracle with specific expertise in the LMS arena. So much so, that Oracle tapped eSkillz to handle the LMS design of the newly launched Learn LMS Global Demo zones. In addition, eSkillz was selected as one of only two partners to assist with the development and testing of Oracle's first Taleo Learn – Open API. eSkillz continues to be a strategic partner for Oracle as Oracle has launched its Oracle HCM Cloud solution and offers the industry a more comprehensive human capital management and talent management suite, inclusive of an LMS (HCM Cloud Learning). eSkillz looks forward to bringing our defined and proven expertise to assist HCM Cloud customers! Join eSkillz for Oracle events throughout the year: User Groups, Best Practices, & more! ICF came to eSkillz with a need to embark on an endeavor to refresh the look and feel and user experience of their Oracle Taleo Learn LMS. ICF felt that the content, links, navigation wasn't currently set up in a manner that made it easy for the users to find what they were looking for. Much of the LMS content had evolved over time (as is the case with most clients), and as a result, wasn’t structured with the user in mind as the LMS continued to evolve. So, a big part of the requested eSkillz Re-Design project was taking an approach that would allow the content to be more modular. Therefore content could be added or removed without affecting other elements on the page. Regions could also be re-arranged if needed based on the current needs of the user base. Our seasoned eSkillz designers decided to take an approach of using bold image based areas to draw attention to content, rather than using text-based descriptions to guide users. Most users tend to scan pages for the content they need, rather than read lengthy description or look for instructions. We wanted to use larger headings and titles, combined with images and graphics to lead the users to the more frequently accessed content or content that is more relevant to their immediate needs, as well as the content that the client wanted the users to consume. Minimizing the amount of readable content reduces the amount of time users spending looking for training. This helps reduce the amount of frustration users experience and increases the effectiveness or efficiency of the LearnCenter LMS as a tool for training. More successful users! - Users now have access to a refreshed and more intuitive LMS look & feel, navigation and menu options leading to a much more successful training experience. Reduced Administrator headaches - By making these changes and improvements to the over-all user experience, this also helped reduce the amount of support inquiries that the LearnCenter administrator had to address. 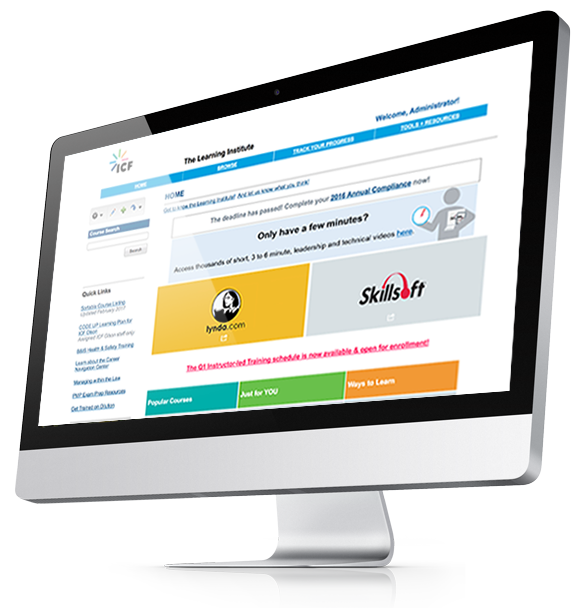 Happy customer – ICF was thrilled with the ReDesign eSkillz completed and their now enhanced and engaging LMS. During a recent Learn Regional User Group meeting, the attendee audience was asked to select their favorite Learn design of more than a dozen featured that day . ICF's Oracle Taleo Learn LMS design was the winner!